REUTERS/Finbarr O’ReillyPalestinians gather near the minaret of a mosque that police said was destroyed by an Israeli Air strike in Gaza City July 30, 2014. Israeli shelling killed at least 15 Palestinians sheltering in a U.N.-run school and another 17 near a street market on Wednesday, Gaza’s Health Ministry said, with no cease-fire in sight after more than three weeks of fighting. Israel’s security cabinet decided to continue its offensive in the enclave and there was no sign of a halt to a 23-day conflict in which 1,326 people, mostly civilians, have died. Some 3,300 Palestinians, including many women and children, were taking refuge in the school in Jabalya refugee camp when it came under fire around dawn, the United Nations Relief and Works Agency (UNRWA) said. “Our initial assessment is that it was Israeli artillery that hit our school,” UNRWA chief Pierre Krahenbuhl said in a statement after representatives of the agency visited the scene and examined fragments, craters and other damage. Blood-splattered floors and mattresses inside classrooms at the Jabalya Girls Elementary School and survivors picked through shattered glass and debris for flesh and body parts to bury. “I call on the international community to take deliberate international political action to put an immediate end to the continuing carnage,” Krahenbuhl said. 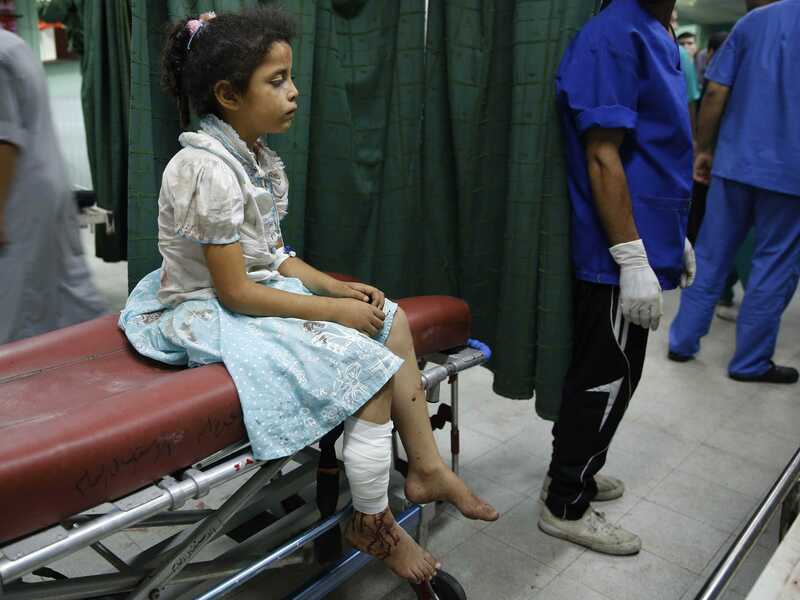 The Gaza Health Ministry put the number of dead in the school attack at 15, with more than 100 wounded. The United Nations said 16 people were killed in the attack. REUTERS/Finbarr O’ReillyA Palestinian girl who medics said was injured by Israeli shelling during an Israeli ground offensive, sits on a bed at a hospital in Beit Lahita in the northern Gaza Strip July 30, 2014. An Israeli military spokeswoman said militants had fired mortar bombs from the vicinity of the school and troops shot back in response. The incident was still being reviewed. 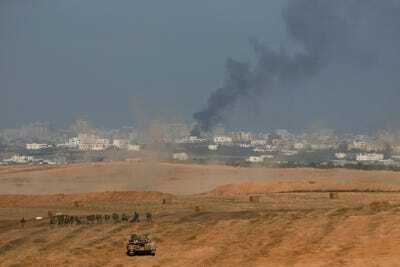 The army said three Israeli soldiers were killed on Wednesday when a booby-trap bomb exploded in a tunnel shaft they had uncovered in a residence in the southern Gaza Strip. UNRWA said on Tuesday it had found a cache of rockets concealed at another Gaza school – the third such discovery since the conflict began. It condemned unnamed militant groups for putting civilians at risk. Krahenbuhl said the Jabalya school’s precise location and the fact that it was sheltering thousands of displaced people had been communicated to the Israeli military 17 times, with the last notification just hours before the fatal shelling. U.N. Secretary-General Ban Ki-moon, speaking in Costa Rica, condemned the killing. “It is outrageous. It is unjustifiable. And it demands accountability and justice,” he said. At the White House, National Security Council spokeswoman Bernadette Meehan said: “We are extremely concerned that thousands of internally displaced Palestinians who have been called on by the Israeli military to evacuate their homes are not safe in U.N.-designated shelters in Gaza. Palestinian man reacts next to the body of his relative, whom medics said was killed by Israeli shelling near a market in Shejaia, at a hospital in Gaza City July 30, 2014. In a separate incident, Israeli shelling killed at least 17 people and wounded about 160 others near a fruit and vegetable market in Shejaia, a heavily bombarded neighbourhood on the eastern outskirts of the city of Gaza, the Health Ministry said. Witnesses said the crowd had gathered to watch a petrol station, hit earlier, burn in the distance. The Israeli military had no immediate comment. 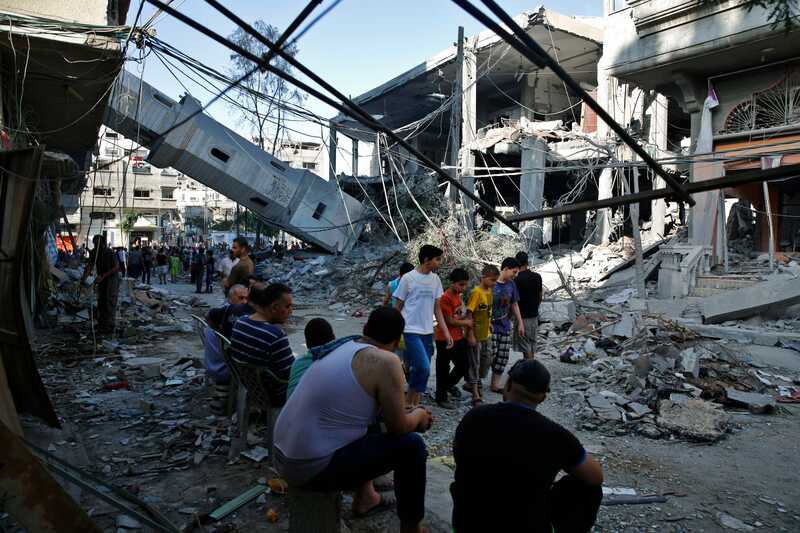 “Such a massacre requires an earthquake-like response,” Hamas spokesman Fawzi Barhoum said. The army said more than 50 rockets were fired from the teeming coastal enclave into Israel on Wednesday, causing no reported casualties or damage. Israeli Communications Minister Gilad Erdan, a member of the Security Cabinet, said the forum had instructed the military to press on with its campaign to locate and destroy tunnels that militants have built under the Gaza border and have used to launch attacks inside Israel. “In the coming few days we’ll be giving the IDF (Israel Defence Forces) full operational freedom to strike against terrorism and complete neutralising and destroying the tunnels,” Erdan told Channel Two. The head of the military’s southern command, Major General Sami Turgeman, told reporters the army was “but a few days away from destroying all the attack tunnels”. 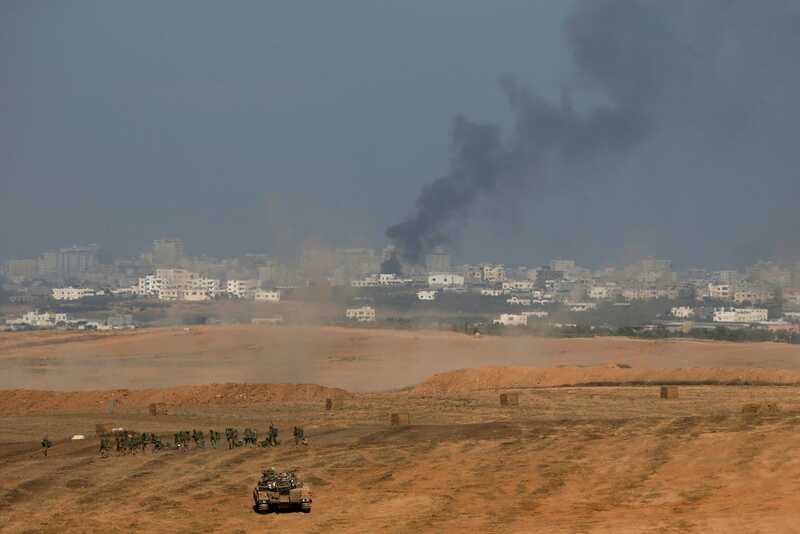 He added that the offensive against militants in the Hamas Islamist-dominated enclave had been broadened to include more targets in the central and southern Gaza Strip. According to the Gaza Health Ministry, 1,326 Palestinians, mostly civilians, have been killed since Israel began its offensive on July 8 with the declared aim of halting cross-border rocket fire and tackling Hamas’s tunnel network. 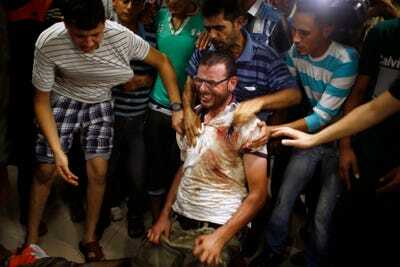 Ninety-nine Palestinians were killed on Wednesday alone. On the Israeli side, 56 soldiers and three civilians have been killed. Public support remains strong for continuing the military operation in the hope of preventing future flare-ups. Mohammed Deif, the shadowy leader of Hamas’s armed wing, said in a broadcast message on Tuesday that Palestinians would continue confronting Israel until its blockade on Gaza – which is supported by neighbouring Egypt – was lifted. Israel has balked at freeing up Gaza’s borders under any de-escalation deal unless Hamas’s disarmament is also guaranteed. REUTERS/Baz RatnerIsraeli soldiers from the Givati brigade return to Israel from Gaza (seen in background) near the border fence July 30, 2014. Egypt said on Tuesday it was revising an unconditional ceasefire proposal that Israel had originally accepted but Hamas rejected, and that a new offer would be presented to Palestinian representatives. Egyptian officials said an Israeli delegation had held brief talks in Cairo on Wednesday, but gave no further details. In previous bouts of fighting between Israel and its neighbours, the United States has often leaned on the Israelis to stop after incidents that caused high civilian casualties. Washington appears to have less sway with either side this time. 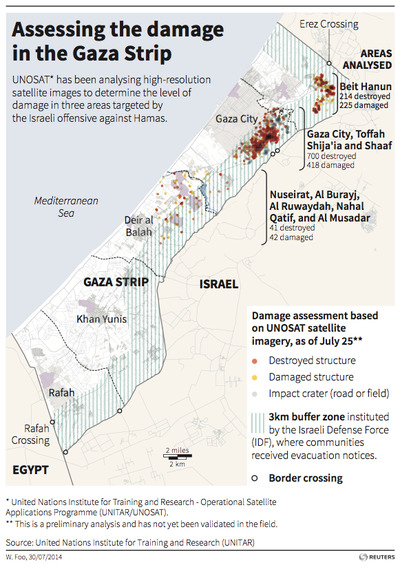 Israel says Hamas is ultimately responsible for such casualties because its fighters, including rocket-launching squads, operate in densely populated residential areas. The army has warned civilians to evacuate whole neighbourhoods before military operations. The United Nations said Israeli bombing over the past three weeks has destroyed or severely damaged 4,000 Palestinian homes, scores of schools and almost two dozen health facilities. 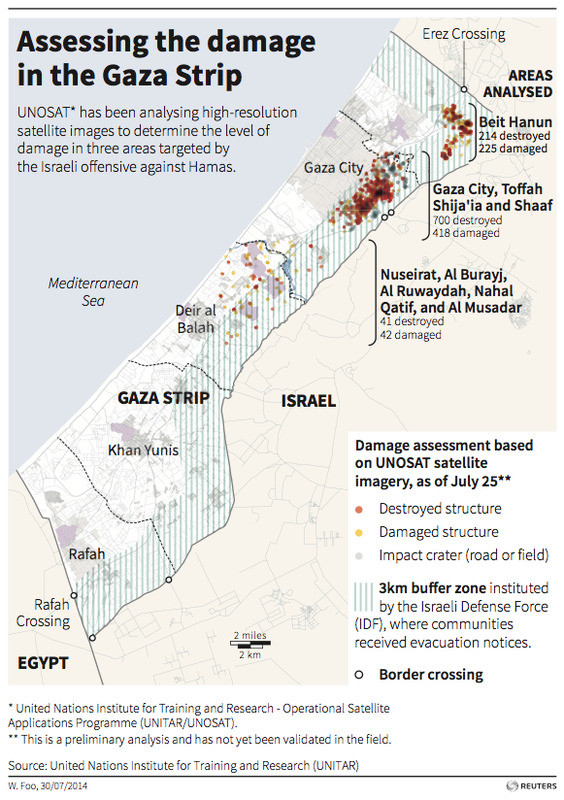 Some 240,000 people in the Gaza Strip had sought refuge in U.N. schools or with relatives or friends, the U.N. said. Both U.S. President Barack Obama and the U.N. Security Council have called for an immediate ceasefire to allow relief to reach Gaza’s 1.8 million Palestinians, followed by negotiations on a more durable end to hostilities. Amidst the bloodshed, Switzerland said on Wednesday it was taking soundings about the possibility of holding aMiddle East peace conference later this year following a request from Palestinian President Mahmoud Abbas. The Swiss Foreign Ministry said in a statement that as custodian of the 1949 Geneva Conventions laying down the rules of war, “Switzerland transmitted this request to the states parties and is currently carrying out informal consultations”, but it noted a broad consensus would be needed on the terms of reference and the expected results.